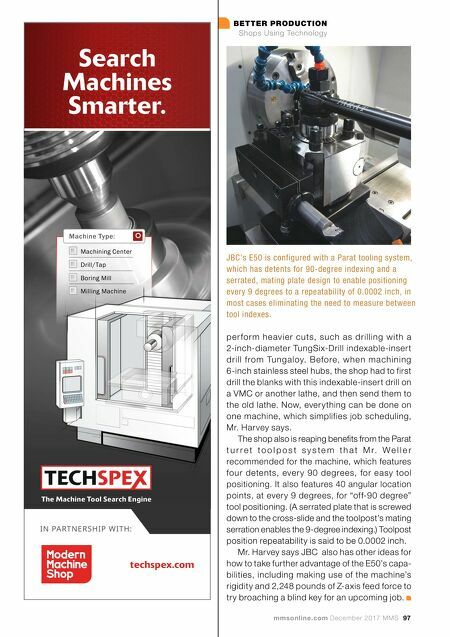 mmsonline.com December 2017 MMS 97 BETTER PRODUCTION Shops Using Technology techspex.com IN PARTNERSHIP WITH: Search Machines Smarter. Machining Center Drill/Tap Boring Mill Milling Machine Machine Type: The Machine Tool Search Engine per form heavier cuts, such as drilling with a 2-inch-diameter TungSix-Drill indexable-insert drill from Tungaloy. Before, when machining 6-inch stainless steel hubs, the shop had to first drill the blanks with this indexable-insert drill on a VMC or another lathe, and then send them to the old lathe. 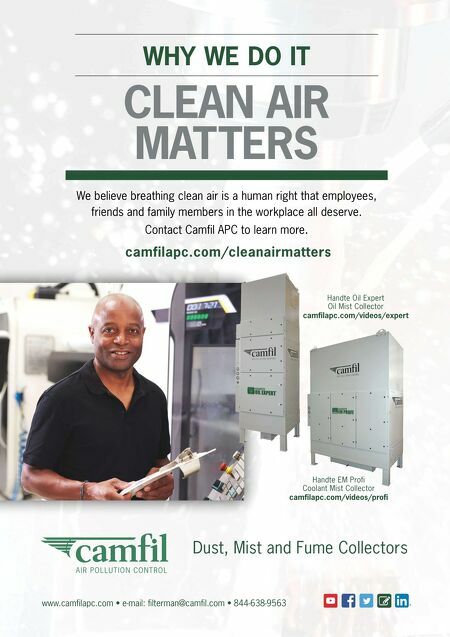 Now, everything can be done on one machine, which simplifies job scheduling, Mr. Harvey says. The shop also is reaping benefits from the Parat t u r r e t t o o l p o s t s y s t e m t h a t M r. W e l l e r recommended for the machine, which features four detents, ever y 90 degrees, for easy tool positioning. It also features 40 angular location points, at every 9 degrees, for "off-90 degree" tool positioning. (A serrated plate that is screwed down to the cross-slide and the toolpost's mating serration enables the 9-degree indexing.) Toolpost position repeatability is said to be 0.0002 inch. Mr. Harvey says JBC also has other ideas for how to take further advantage of the E50's capa- bilities, including making use of the machine's rigidity and 2,248 pounds of Z-axis feed force to try broaching a blind key for an upcoming job. JBC's E50 is configured with a Parat tooling system, which has detents for 90-degree indexing and a serrated, mating plate design to enable positioning every 9 degrees to a repeatability of 0.0002 inch, in most cases eliminating the need to measure between tool indexes.